Fogo de Chão translate in Portuguese as “Fire Ground”. Such a fitting name when you are talking about meat cooked with direct fire. 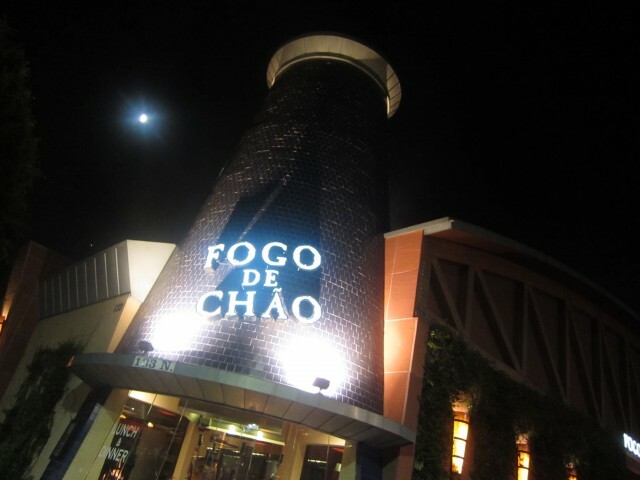 When you think of Brazilian BBQ, Churrascaria in Los Angeles, Beverly Hills to be exact, Fogo de Chao comes to mind. If you put endless quality meats together with Beverly Hills, you know its going to be expensive. Taking advantage of the Dine LA menu, you save nearly 20 bucks a person. Not only do you get to eat all the meat you want, but well, I guess that’s it. Bottom line, its a buffet, but nothing like the cheapy-deapy stuff. I tend do eat everything and anything that is served at buffets, so I had to strategize. Not a lot of carbs, just meat. 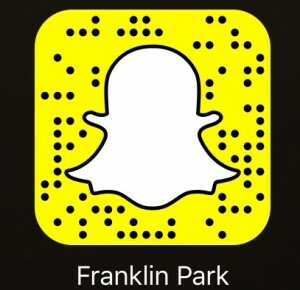 You and your green on one side, red on the other coaster, and your meat. My coaster was on green for a while, meaning, bring on the meat! The servers made sure I had the cut of meat I wanted. Servers with swords came by and carved away at the perfectly cooked meats — think meat skewers for a T-Rex. I got lucky and always had the outer crust — that’s where all the flavor is. Green means go — I was ready to eat. Speaking of strategy, the restaurant has their own game plan — get guests full on breads and carbs. As am appetizer, they serve some pão de queijo, the bread. 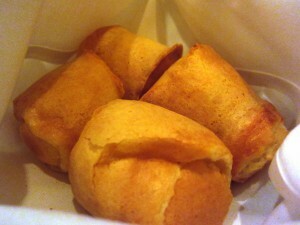 Freshly baked and warm, they were so chewy and gooey in the middle with a nice milky flavor. You can easily eat too much of these and leave no room for the meat. Be careful. 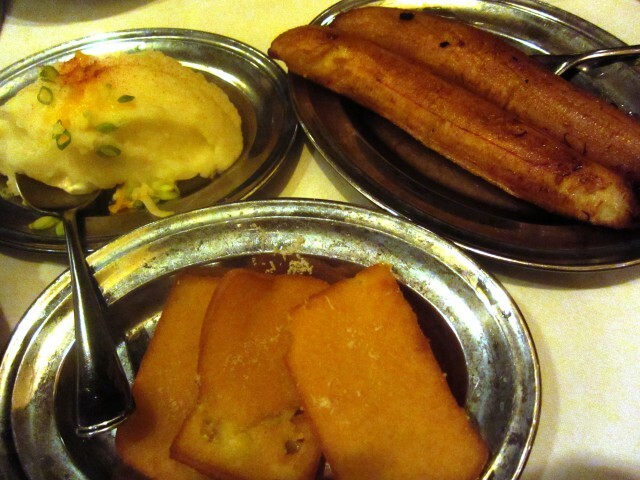 To add to this carbohydrage stomach filler, they give three sides — garlic mashed potatoes, crispy fried polenta, caramelized bananas. They even offer more sides of rice, beans, and forofa upon request. Wanting the meat, I forewent the extra sides. My favorite were the crispy polenta. It tasted like large sheets of french fries with a crunch like no other. The caramelized bananas were great in between meats — It helped keep the taste buds alive, going back and forth from savory to sweet. The sides were delicious and plenty, but I made sure not to over do it. Picanha: This is their Top Sirloin. The meat is very tender and lean with a nice fat layer encapsulating the meat. Alcatra: This is also their Top Sirloin. This had a strong beef flavor, probably the most of the group. Filet Mignon: Of course, this was one of my favorites. Not wrapped in bacon like other Churrascarias, this one was the purest and cleanest beef of the bunch. Though very lean, it was very juicy. It was the softest of them all and it melted in your mouth. Ancho: This is the Rib Eye. One of my favorite cuts of beef, this was one of my favorites. It had a good balance of fat and meat. It was cooked perfectly. Fraldinha: This is the Bottom Sirloin. The meat was tender as well but had more marbled fat within the meat. 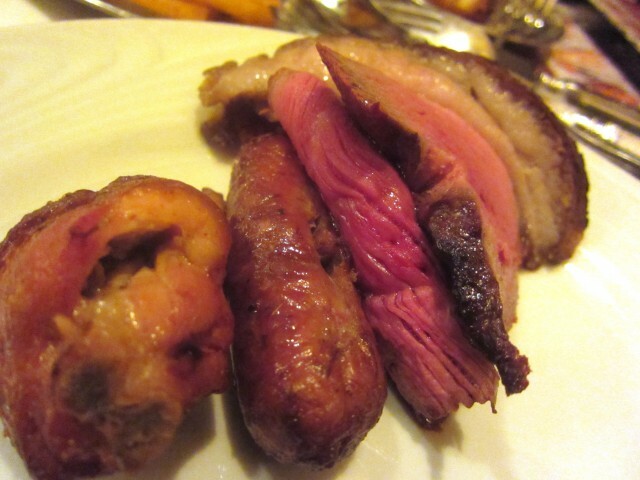 I liked this far more that the Picanha. Cordeiro: This is the Lamb. I am not much of a lamb fan. They cooked it well enough to make it juicy and not so gamey. Frango: This is the Chicken. On the bone, the flavor was clean and of the highest quality. It was cooked nicely with a tasty seasoning on the outside. It was a nice pair with the Linguica. Linguica: This is the Sausage. It had a nice snap with the natural casing. The sausage was salty and not too fatty. It was perfect with the chicken. Fogo’s salad bar was impressive as well. 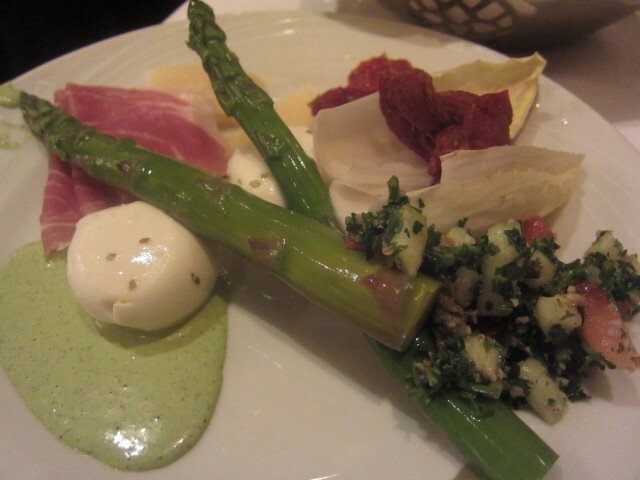 Ranging from vegetables, salads, cheeses, salumi, sauces, and more, they were perfect pairings with the meat. Some of the things that stood out were the endive, cheeses, and bacon. Yes, they had a whole bowl full of fried bacon. 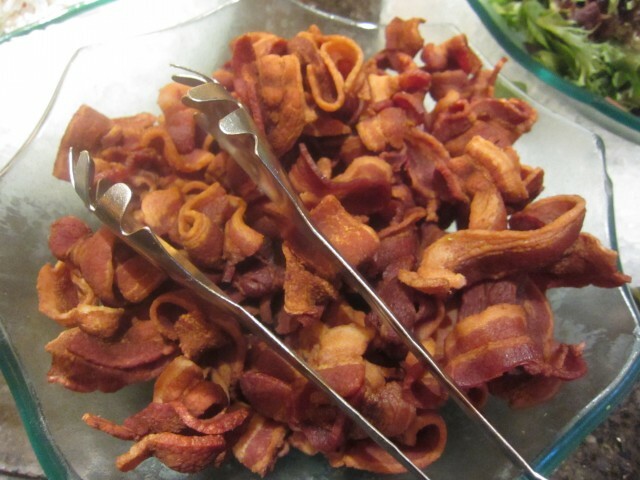 Any buffet with a large bowl full of bacon is fine by me. 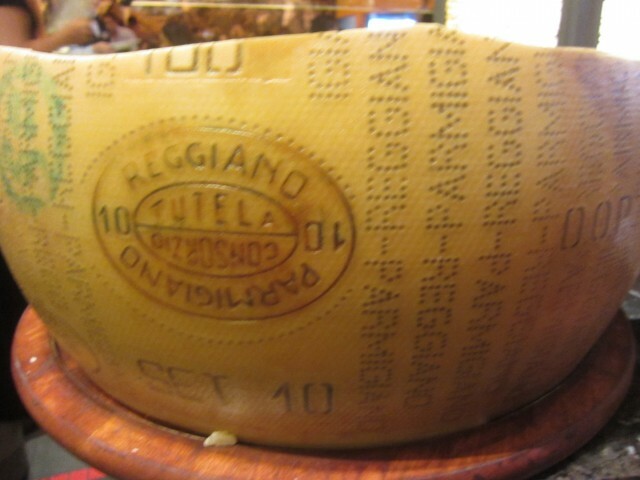 Another thumbs up for me was the whole Parmigiano-Reggiano cheese wheel. This was the real stuff, from Italy. It was great with the prosciutto and the meat. All of the vegetables and cheeses were great with the meat. The Dine LA menu has changed since the past. Fogo was a few bucks cheaper and gave dessert at the end of the meal. Though the dessert was taken off the menu, it was still a great deal. The meat was amazingly tasty and generously seasoned. The sides and salad bar was fresh and good quality. 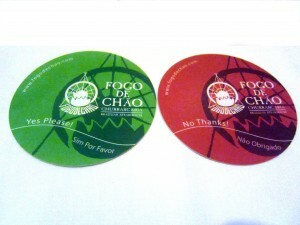 When you dine at Fogo, you are eating like Kings. Thanks to Dine LA and Restaurant Week, I could do it for cheap(er). Any carnivore like myself can appreciate Brazilian BBQ, but at the end of the day, it’s a buffet, a mega chain that exists all over Brazil and United States. At the end of my meal, I got my money’s worth and felt I needed to take a shower. Covered in meat sweat and filled with grease, I was satisfied.